After the fantastic opening credits (must see), you know very quickly that you are in for an increasing death toll (massive death toll to be more descriptive) involving people being cut in half (lengthwise), heads exploding, knifings, shootings, drownings, explosions, and any number of unique ways to die. After the loss of a trainee 20 years or so ago, Kingsman Colin Firth (Galahad) visits the trainee’s wife with a medallion and promise to help if they ever need it. The wife refuses so Galahad gives the medallion to the young son. The son grows up and eventually trains to be a Kingsman. 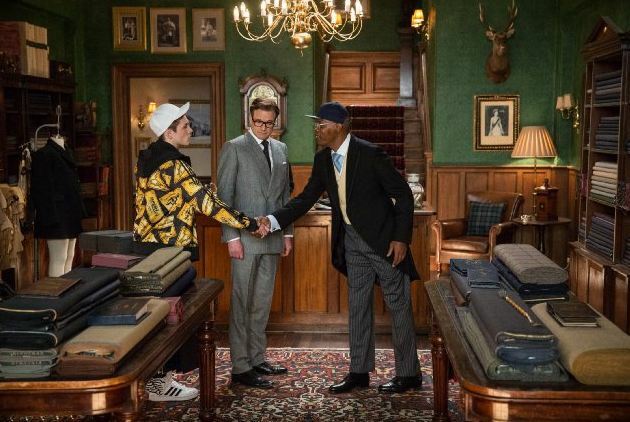 Currently, another Kingsman (Lancelot, Jack Davenport) takes it upon himself to rescue a kidnapped Professor (Mark Hamill). He almost single handedly kills all of the kidnappers….almost….from behind he is is hit in the head, and after a few seconds of confusion, falls apart in two pieces, split in two lengthwise by a beautiful assassin, Gazelle (Sofia Boutella). Her boss arrives once the bodies have been covered up (the boss does not like the sight of blood, it makes him “Hurl”). The boss is Valentine (a speech impedimented Samuel L. Jackson). It turns out that Valentine is a super geek afraid that humanity is killing the earth and has decided that the only way to stop the destruction of earth is to kill most of the human population (a story line also told in the book “Inferno” by Dan Brown). He does this by controlling people (to kill, or to explode) via a SIM card in their cell phones, or, for his closest associates & employees, surgically added behind their ears. He gets EVERYONE to load his SIM card by offering FREE cell phone service, forever (knowing “forever” is going to be a short time). Missing Lancelot, the Kingsman interviews for his replacement. The son with the medallion is one of the interviewees, and we follow the interview process as it weeds out all but one, and then we get to the crux of the movie: trying to stop Valentine from wiping out most of the human race. Although spies, killing, and murder is dead-on my favorite genre (I read Thrillers), I did not like Kingsman (except for a few VERY unique scenes, like the opening credits or towards the end of the movie; hundreds of heads exploding to marching, or fireworks, music). Lori enjoyed it…go figure. It is just too weird for me. It is definitely not for kids, or the sqeeemish, and it is rated R for a damn good reason: Killing on a massive scale.